Gov. 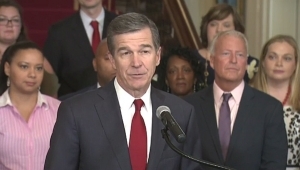 Roy Cooper spent Tuesday touting recent increases in funding for North Carolina’s state-run, Pre-K program, as well as reaffirming calls for additional cash in the years to come. As Ed N.C.‘s Alex Granados reported Tuesday morning, Cooper visited a Burlington school to talk about the program, which received funding for an additional 3,500 new slots statewide over the next two years. The state initiative assists low-income families in obtaining a Pre-K education, something K-12 advocates tout as a long-term boon for students, particularly students that hail from poor families. In his proposed budget this year, Cooper proposed a larger increase that would have ended the state’s waiting list by increasing the number of funding slots by more than 4,000. Republican lawmakers trimmed the Democratic governor’s recommendation, although still offered up about $27 million over two years to expand the program. New Pre-K slots vary by locale, but here’s a county-by-county examination of the state’s pre-K expansion provided by Cooper’s office.